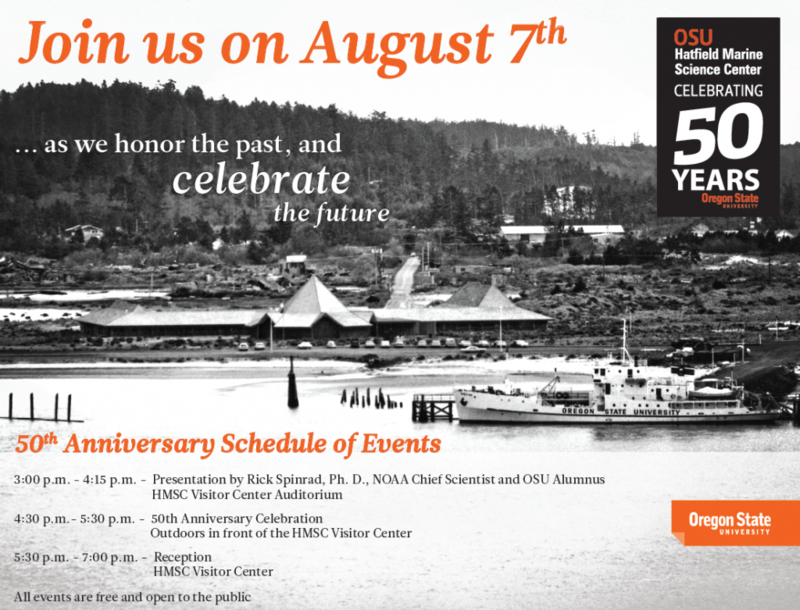 Fifty years after OSU dedicated the Marine Science Center, Oregon State University will honor the past with a special 50th Anniversary Celebration, and look to the future with OSU’s Marine Studies Initiative. Join us! Friday, August 7 at 4:30 pm on the HMSC campus. The Celebration will feature distinguished speakers, a historical slide show and a new video celebrating HMSC’s bright future. The Celebration, located outdoors in front of the HMSC Visitor Center, will be followed by a reception in the Visitor Center from 5:30pm to 7pm. Don’t miss our 3pm Alumni Presentation by OSU Alumnus and NOAA Chief Scientist Rick Spinrad! This special event will be in the Visitor Center Auditorium. All are welcome! Events are free and open to the public. Download a flyer here, and see our website at hmsc.oregonstate.edu/50th for updates. Pass the word! Please post or forward. For more information contact Maryann Bozza at 541-867-0234 or maryann.bozza@oregonstate.edu. We look forward to seeing you on August 7th!